Gelug is the youngest school of Tibetan Buddhism. It is also known as Gelug-pa and it was founded by Tsongkhapa, who lived between 1357 and 1419. Je Tsongkhapa was a leader of Tibetan Buddhism and a philosopher. Tsongkhapa was an eclectic Buddhist who had traveled through Tibet and took the chance to study under Sakya, Kagyu and Nyingma teachers. He also adhered strictly to the monastic discipline vinaya. Along with his disciples, Je Tsongkhapa founded the Ganden monastery in 1409, that was the first of the Great Three Gelug Monasteries. The others were Drepung, founded in 1416 and Sera, founded in 1419. 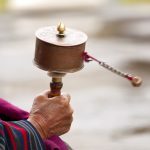 As the order had a reputation for strict adherence to monastic discipline and scholarship, as well as tantric practice, it grew very quickly after the death of its founder Je Tsongkhapa. Gelug: do you know its most influential figure? There are several people known in this school of Tibetan Buddhism, like the nominal head of the Gelug school Ganden Tripa. However, its most influent figure is without any doubt Dalai Lama. The Gelugs allied themselves with the Mongols as their patron and they emerged as an eminent Buddhist school in Mongolia and Tibet since the end of the 16th century. The main teachings of the Gelug school are the Lamrim teachings that are based on the teachings of the Indian master Atisa. These teachings lead the practitioners in their path to awakening, where they can achieve several levels based on the classical Indian Mahayana model of the Bodhisattva, which shows five paths and ten levels. The practitioners begin by seeking a good rebirth, then a liberation for oneself; afterwards they seek Buddhahood, the liberation of others. The correct view of emptiness. Besides that, the Gelug-pa school is centered on vinaya, the ethics, and monastic discipline, as the main focus of its spiritual practice. They emphasize the need to pursue spiritual practice in a sequential and graded way.